Prominent Bahraini activist Nabeel Rajab has been sentenced to six months in prison for a tweet posted last year, which was considered insulting to the Gulf Kingdom’s Ministries of Interior and Defense. The world-renown human rights activist and president of the Bahrain Centre for Human Rights (BCHR) posted a tweet confirming his sentencing and saying it would be suspended pending a fine of about $530. In October Rajab was arrested and charged with publicly "insulting a public institution". The Interior Ministry stated that it had summoned Rajab “regarding tweets posted on his Twitter account that denigrated government institutions.” Rajab was freed on bail in November having spent a month in detention. He could have faced up to six years in prison. In his tweet posted in September, he suggested that Bahraini security institutions could act as an "ideological incubator" for terrorism and Islamic State militants. He allegedly posted the tweet as a comment to an article published on Global Voices in July concerning former Bahraini politicians and preachers, who had pledged allegiance to IS militants. The human rights watchdog Amnesty International said in response that the Bahraini ruling was a blow to freedom of expression. 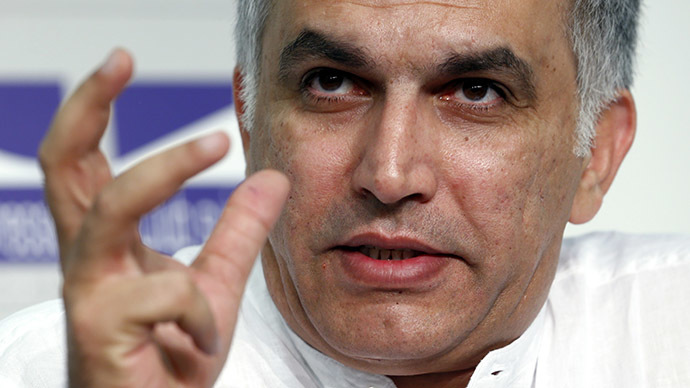 “Nabeel Rajab is being unjustly punished simply for posting tweets deemed insulting to the authorities. His conviction is a blow to freedom of expression – it must be quashed. He should be released immediately and unconditionally,” said Said Boumedouha, Deputy Director of Amnesty International’s Middle East and North Africa Programme on Tuesday. Amid the Gulf Kingdom’s crackdown on the country’s opposition, on Monday the Public Prosecution referred Sheikh ‘Ali Salman, leader of the main opposition group, Al-Wefaq, for trial on charges of “promoting the overthrow and change of the political system by force and threat,” as well as “inciting non-compliance with the law” and “publicly inciting hatred against a segment of the population”. Anti-government protests have been taking place in Bahrain since the start of Arab Spring revolutions across the region. The kingdom, which hosts the US Fifth Fleet, brutally cracked down on the popular uprising in 2011. The majority Shia population of Bahrain complains of discrimination and lack of democracy in the oil-rich kingdom, while the Sunni monarchy often accuses its archrival Iran – a Shia powerhouse – of instigating unrest in the country. “It’s terrible, it’s a shame that this is unfortunately how Bahrain treats anyone who speaks out or criticizes the government – they put them in jail,” Dominic Kavakeb, from the Bahrain Justice and Development movement in London, told RT’s Anissa Naouai.